I have this rule that I can buy magazines only when I’m traveling. When I’m on the road, I have a permission to pick up any publications, even trashy tabloids, although I usually end up selecting my usual The Oprah Magazine and Real Simple (and maybe The New Yorker when I’m in the mood for some intellectual read). Finally growing into my true self. Breakfast (9:00 a.m.): Had a quick rice bowl with leftover Korean BBQ beef and seaweed salad for breakfast before the workout. I was halfway through the bowl when I realized that I forgot to take a picture. Workout: Saori came over to my neck of the wood and trained me, Tiffany, and Shannon on Kangoo at Rose Bowl. She has wanted me to try this rollerblade-meets-trampoline exercise for several years but I resisted, until today. It was a little difficult to get the hang of it at first, but it became super fun once I got over the fear. We ended up having an absolute blast! I think I’m officially a Kangoo addict. I can’t wait to do it again on Wednesday! Lunch (1:30 p.m.): After the Kangoo workout, we went to Le Pain Quotidien (our usual) for well-earned lunch. Instead of the usual bread basket, we split two chocolate croissants among the four of us. 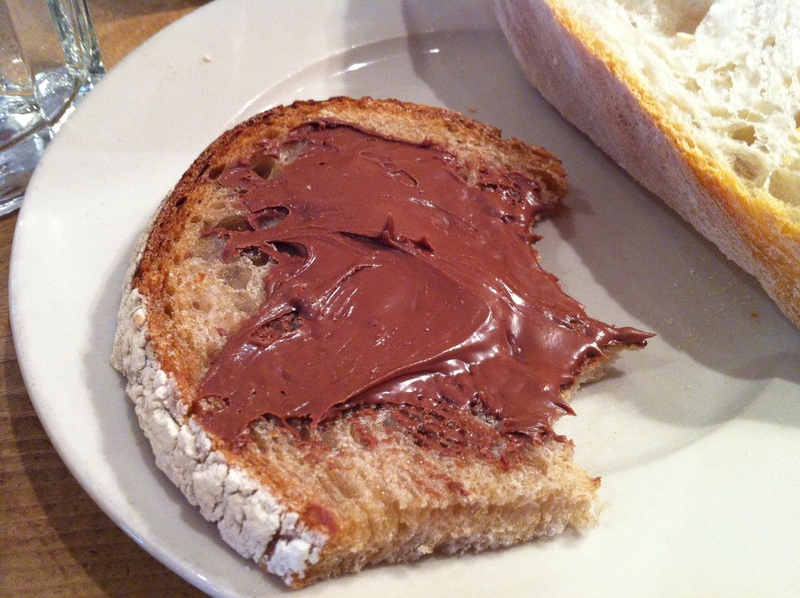 I was still hungry so I had two pieces of bread with its homemade Nutella-esque hazelnut spread. I was in heaven. Snack (5:00 p.m.): After I came home, took shower, and threw clothes in a washing machine for the second time, I had a small bowl of rice with squid kimchi and seaweed salad. Dinner (7:30 p.m.): I realized that I ate just a little too much again today (despite the workout) so I decided to go light and ate shabu nabe with napa cabbage, mushrooms, onion, tofu, and five pieces of sliced pork for dinner. No rice because I already ate it for snack a few hours earlier. It was a wonderful weekend. I’m looking forward to a great week! And by “you’ I mean “your”, darn grammer check! I love your six words, Shannon, so much! It’s a reminder how lucky we are to have all that we have … and yes, we truly deserve all the happiness in the world! Thanks for sharing! That’s a good one, Remi! I love it! I think “everyday” is two words, but it doesn’t matter! LOL. We make up our own rules, right! YEAH! Very nice food photos. I wish I have this presentation.edge.